The U.S. Lawn Mower Racing Association (USLMRA) is proud to welcome back M.E. Miller Tire Co. of Wauseon, Ohio as Official Tire Sponsor and presenter of the annual STA-BIL National Lawn Mower Racing Series Driver of the Year Award. M.E. 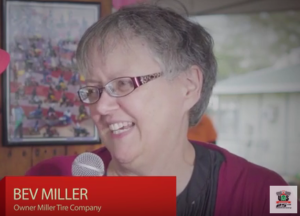 Miller Tire, Wauseon OH, is proud to be the USLMRA “Official Tire Sponsor.” On the website, you can choose from a large selection of lawn & garden tires (including hard-to-find sizes) made by Carlisle, Firestone, Kenda, Rubber Master and others. You will also find ATV, farm, and puller tires and more. Established in 1970, Miller Tire sells the smallest lawn & garden tires to the largest farm tractor tires from leading manufacturers for cars, trucks, ATVs, lawn mowers and more. Miller Tire also specializes in agricultural and “hard-to find” tires and stocks the largest selection of antique farm tractor tires available anywhere in the USA. “Serving your enTIRE needs” is the company motto. 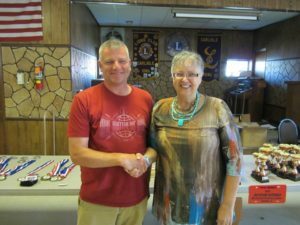 “We had a great time in 2017 helping celebrated the USLMRA 25th Anniversary,” said Miller Tire Co-Owner Bev Miller. “We enjoyed presetting the 2017 Driver of the Year Award to Mike Enos and we’re looking forward to more fun times this year. For more information please visit www.millertire.com.